During June 2005 a gang of antiquity thieves was apprehended during an illicit excavation of a burial cave located on the eastern slopes of Horbat Kelah, 2 km west of Modi’in and 7 km east of Lod. 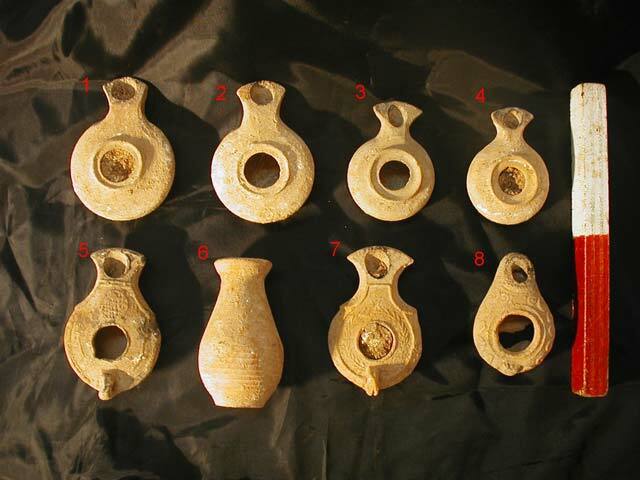 The plunder that was confiscated from the robbers by the Unit for the Prevention of Antiquities Robbery (Israel Antiquities Authority) included an assemblage of pottery vessels and an intact ossuary. The cave and an adjacent one (Permit No. A-4555*; map ref. NIG 197140/647689; OIG 147140/147689; NIG 197143/647670, OIG 147143/147670) were documented by A. Re’em on behalf of the Israel Antiquities Authority, with the assistance of T. Kornfeld, D. Sandhaus and R. Bar-Nathan (pottery reading). Horbat Kelah is the easternmost of two adjacent ruins that extend across a moderate spur in an east–west direction; the western ruin is known as Horbat Zekharya. They were surveyed several times, in the second half of the nineteenth century CE by Clermont-Ganneau and Conder and Kitchner (SWP), prior to the establishment of nearby Modi‘in, and before the construction of the Modi’in industrial zone (HA-ESI 111:54*). Building remains were discerned at the summits of the two ruins, and there is probably also a Byzantine church (a building and a baptisterium) at Horbat Zekharya, as well as an extensive scatter of potsherds that date to the Hellenistic, Roman and Byzantine periods. Caves, agricultural installations and cisterns were surveyed at the foot of the ruins. On the northern slopes of Horbat Zekharya is a burial cave which dates to the Roman period, as well as a complex of caves that was used as dwellings by monks, with a large pool (Bir esh-Shami) alongside them. There are those who consider these caves to be “Me‘arata Dalod” to which legends have been ascribed about Jews who resided in the region during the time of Roman rule. The cave was found filled with alluvium and debris and it was therefore not possible to document it. From the illicit excavation that was conducted in it we noted that this is a kokh-type cave that is typical of the latter part of the Second Temple period. The cave opening is in the north; around it are signs of rock-cuttings in bedrock.Ossuaries were observed in situ in the fill inside the cave along with numerous potsherds and human skeletal remains belonging to a number of individuals. The pottery assemblage that was removed from the cave during the robbing dates the beginning of its use to the end of the first century BCE–beginning of the first century CE, as evidenced by the mold-made lamps (Figs. 1:1–2; 2:2–3) and a fragment of a stirrup juglet (Fig. 2:1). Two other lamps date from the first half of the first century to 68 CE (Fig. 1:3–4). The cave was used between the years 70 and 135 CE as attested by two mold-made Southern-type lamps, one decorated with a strainer pattern on the nozzle and a coalpan, the other with a wreath around the filling hole (Fig. 1:5, 7; Fig. 3). In addition to these vessels a drop-shaped juglet (Fig. 1:6) was found that also dates to the period between the Revolts. The tomb was used again in the third–fourth centuries CE, as evidenced by a lamp with elliptical body and a large filling-hole, a lug handle and a geometric decoration that covers its entire surface (Fig. 1:8). These lamps are characteristic of the third–fourth centuries CE and were popular throughout the central and southern regions of the country. The pottery assemblage is therefore indicative of a prolonged period of use that began in the first century BCE and continued until the Bar Kokhba Revolt (135 CE). Following a hiatus the cave continued to be used during the third–fourth centuries CE. 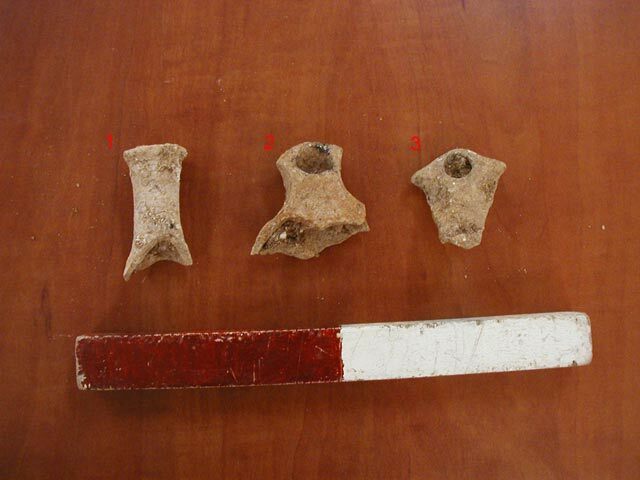 In the cave and debris from the illicit excavation a large number of stone ossuary fragments were found, as well as an intact ossuary without a lid that had been removed from the cave during the course of the robbing activity. The ossuary is made of local limestone (0.28 × 0.23 × 0.50 m; Fig. 4); it stands on four short legs and its side is adorned with two carelessly incised rosettes enclosed within a frame of circles and scales. This cave was found devoid of artifacts, a sign that it was probably plundered. It has an opening (0.8 × 0.9 m) in its northern façade that is enclosed within a stepped frame meant to incorporate a square sealing stone that was not found in the vicinity (Fig. 6). 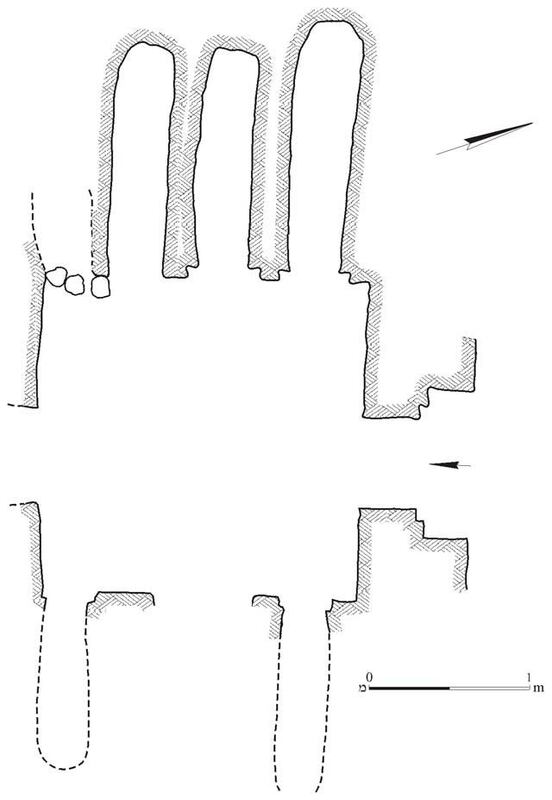 The burial chamber is square (2.8 × 2.9 m; Fig. 7) and was meticulously hewn. 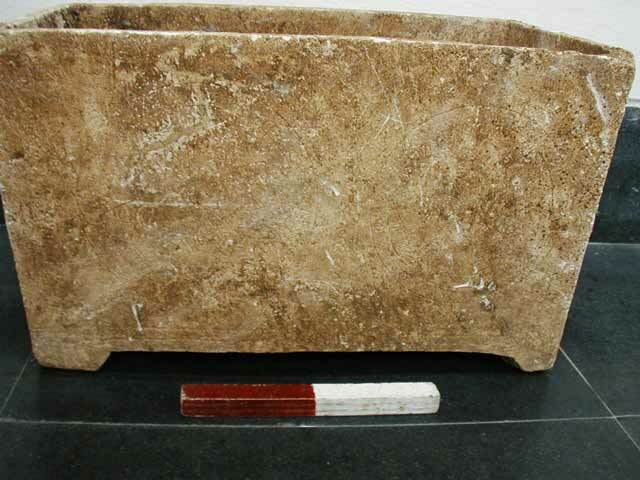 The floor of the burial chamber is filled with alluvium to the top of the kokhim and therefore it is not known if there is a standing pit in its center. Kokhim with a sunken frame around their opening into which a closing stone was meant to be inserted are hewn in the sides of the chamber. Four kokhim (Fig. 8) were hewn in the western wall and two were discerned in the eastern wall; however, it seems that the alluvium is covering one or two others in this wall. In the front of Kokh 4 is a concentration of small fieldstones that blocked the opening. The southern wall of the burial chamber was found covered with alluvium but it seems that kokhim were also hewn there. In the upper part of this wall is a broad opening that is partly hewn and partly natural. The opening is currently blocked by debris and the nature of it is unclear; it probably leads to another burial chamber. 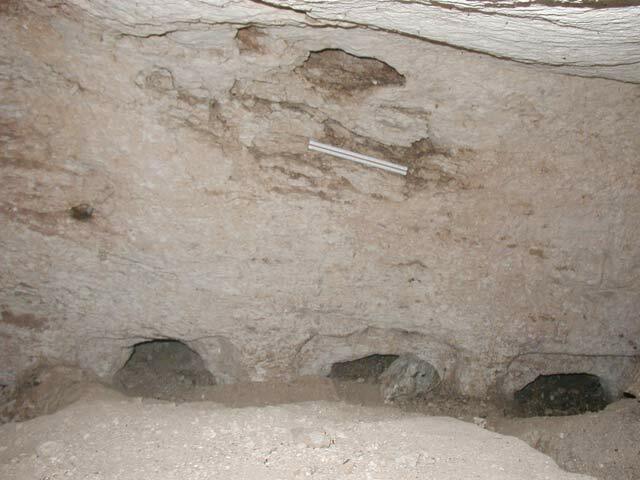 Based on the ceramic finds, the method of burial in kokhim and the presence of ossuaries the two burial caves should probably be attributed to a Jewish settlement that existed at the site in the latter part of the Second Temple period. Tomb 1 was reused in the Late Roman period and the beginning of the Byzantine period. 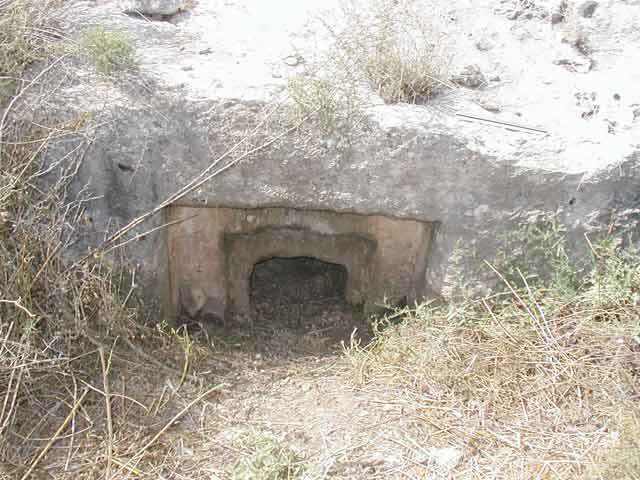 These caves join other burial caves and arcosolia tombs located along the eastern slopes of Horbat Kelah and constitute part of the settlement’s necropolis from the end of the Second Temple period until the Byzantine period. 1. Cave 1, lamps and juglet. 2. Cave 1, fragments of lamps and juglet. 3. 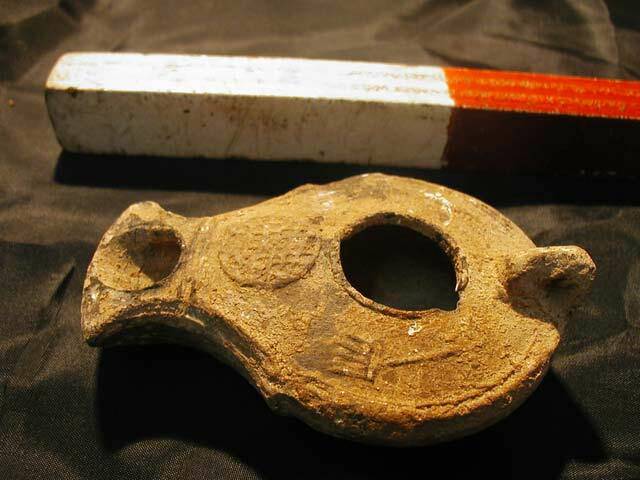 Cave 1, a strainer design and a coalpan on a lamp. 6. Cave 2 opening, looking south. 7. Cave 2, looking from inside the cave out, beyond the opening. 8. 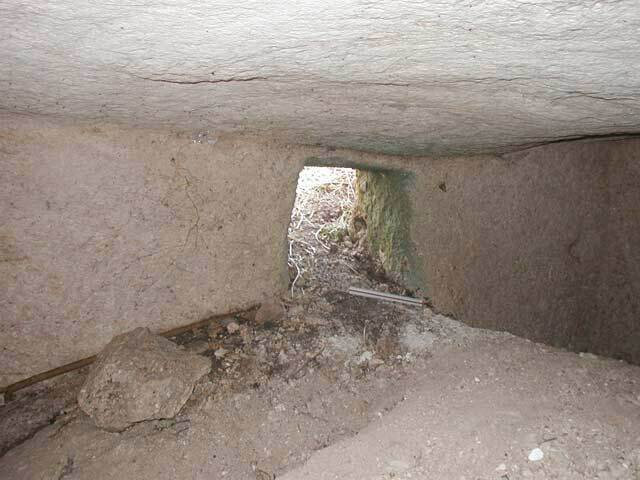 Cave 2, view of the kokhim in the western side of the chamber.